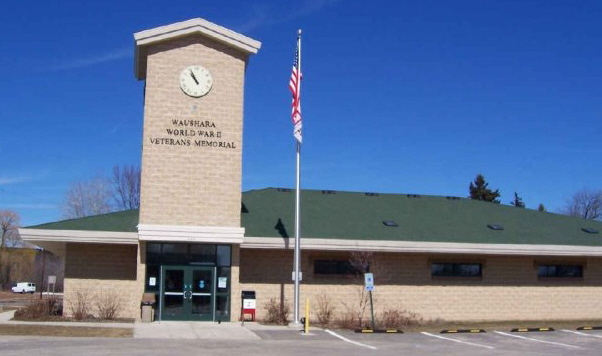 The Waushara WWII Veterans Memorial was made possible through a generous bequest from the late Dale Severns. Completed in Summer 2003, Waushara County’s World W ar II Memorial symbolizes the eternal debt of gratitude that our society owes to the treasured members of America’s “Greatest Generation.” These men and women courageously served in the United States Armed Forces during the time of our nation’s most pressing need. The interior walls of the structure are covered with over 800 plaques telling the individual stories of these brave citizens of Waushara County. The building consists of a large atrium space, 350-person capacity meeting hall with kitchen and food service bays, full bar service, and two coatrooms. It’s the perfect setting for a meeting, a wedding, a party or an exhibit. For more information on renting this building for your event, call City Hall at 920/787-4044 to check available dates or request a brochure.